The above watercolor was painted on masa paper. I had a little easier go of this one. It is very similar to Coming Home, a painting I struggled with last month. This is taken from a photo that I had stashed away for about five years. It is a small railroad bridge and creek about six miles from my home. On a quiet winter night, I can actually hear the trains’ whistles and rumbling on this stretch. Makes me recall my youth when much was transported by train and I was always hearing those sounds, anywhere. Sounds from the past mesmerize me. 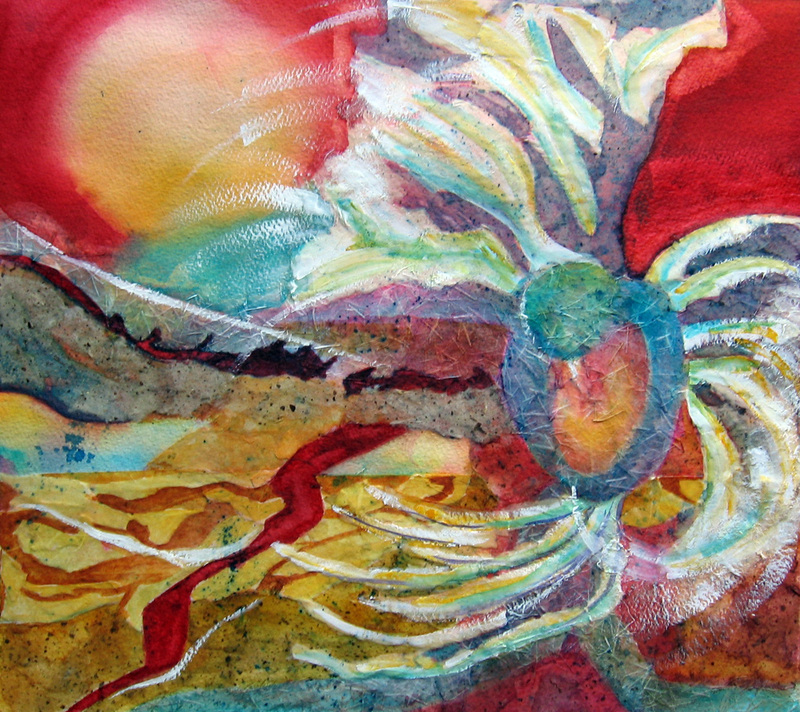 The above painting is the next step in following the book titled Watercolor and Collage Workshop by Gerald Brommer. I was to draw something realistic and design all of the format surrounding that realistic image with what I had learned in the previous exercise by using the rice papers and watercolor techniques. I want to try several of these after experimenting with this one. It was wonderfully freeing to play with the papers and decide which ones I wanted to incorporate to tell a story. My thoughts about the title for this piece went from “This Old House” to “Living on the Edge” to, finally, “..there will be roses”. I guess that would be the best way to describe what happens to me, the artist, as I let go and allow the papers and the color to inform me of what they want to become. I thought about my attraction to old homes, what goes into keeping them up, what many have faced during trying financial times, to thinking positive in the face of of such times. For those of you following and wishing to try this on their own, at home, I have included the step by step process below. I drew the realistic object I wanted to include. 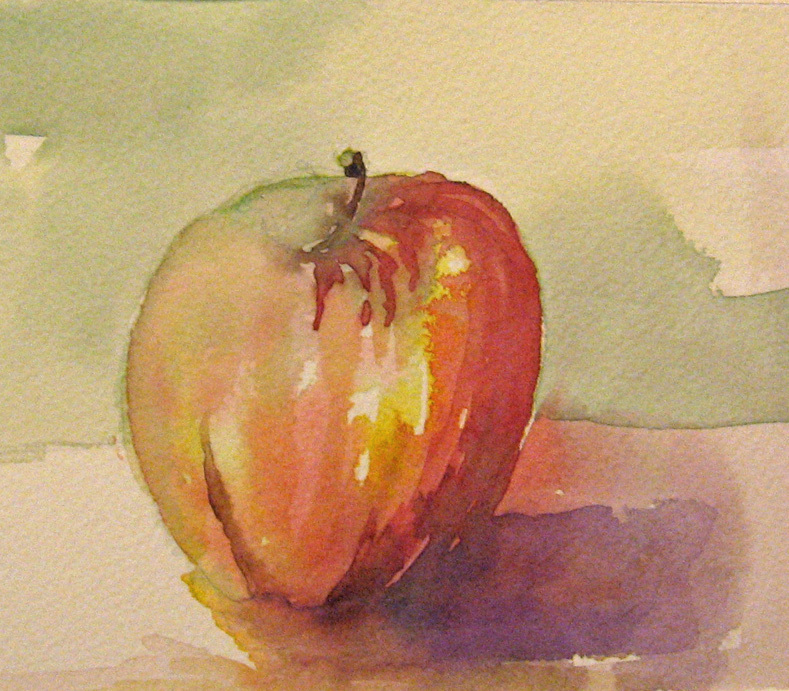 In the next step, I, first, painted several large washes of color surrounding the realistic object. I decided to run some of the color down and into the roof. Notice that these washes bridged the sides of the paper. I allowed those washes to dry. This step can be shortened by using a hair dryer to dry the initial washes. I then mixed my matte medium for glue. I use acrylic matte medium with just a little water to make the mixture creamy. I then selected and tore different pieces of rice paper to begin glueing to the surface and designing the space surrounding the home. 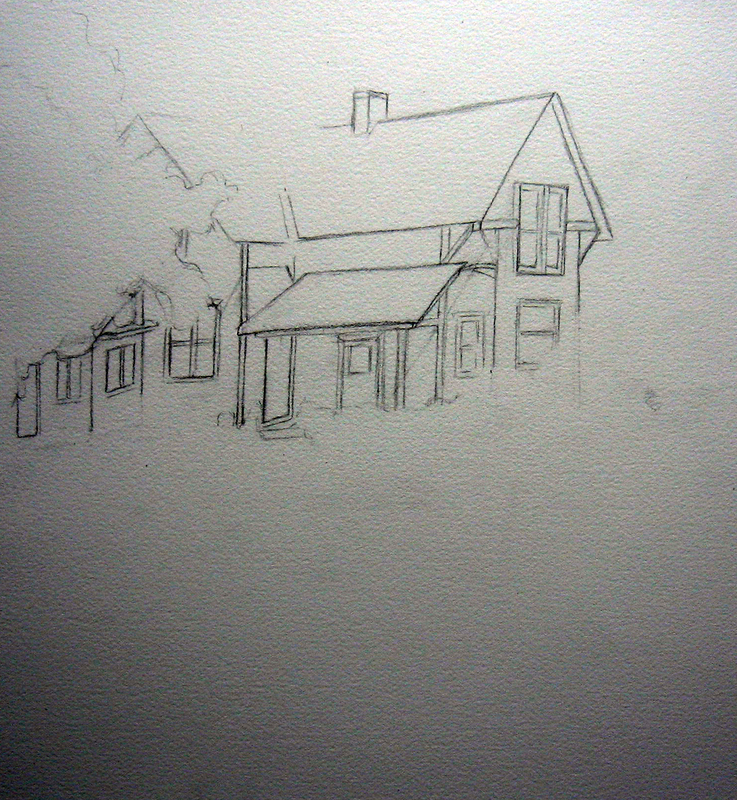 I did not use the landscape in the photo that I used to draw the house. I allowed myself the pleasure of being creative and designing my own format. I wanted the home to look as though it was sitting on top of a hill in golden light. 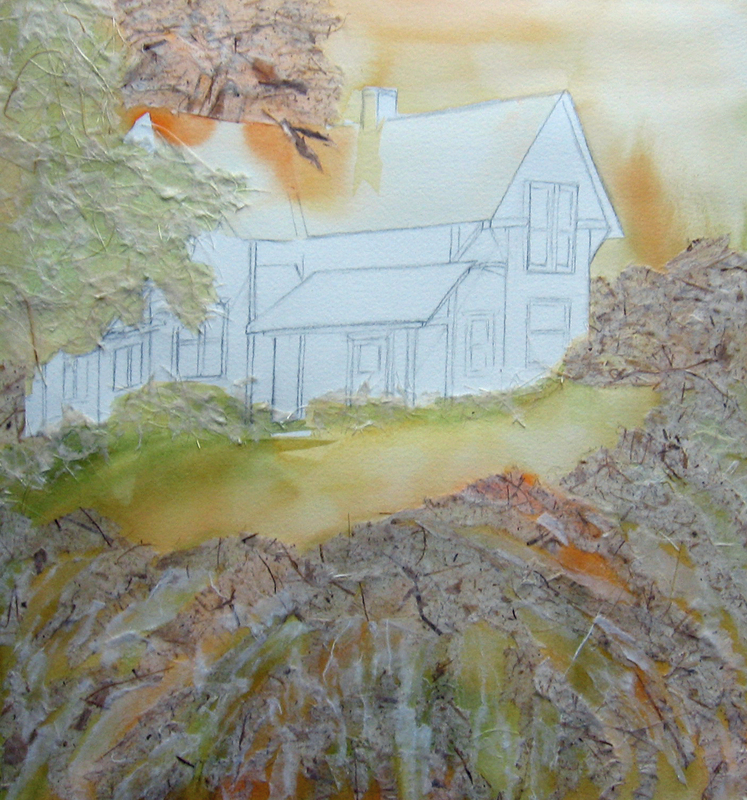 I tore the papers and placed them on the hill so as to direct the viewers eye up the hill and toward the house. I chose a very light and different textured paper to represent the tree to the left of the home and tried to create a shape that pointed toward the front porch. I chose a darker rice paper to shape the tree to the left and behind the home and created a shape that also pointed toward the porch and dropped across the roof. I then included some low plant life around the front of the home and darker bushy like shapes to the right of the home. I wanted to create an atmosphere that appeared as though nature was hugging the home. I allowed this step to dry overnight. I painted these paper shapes and concentrated on the image that began appearing around my central object, the home. 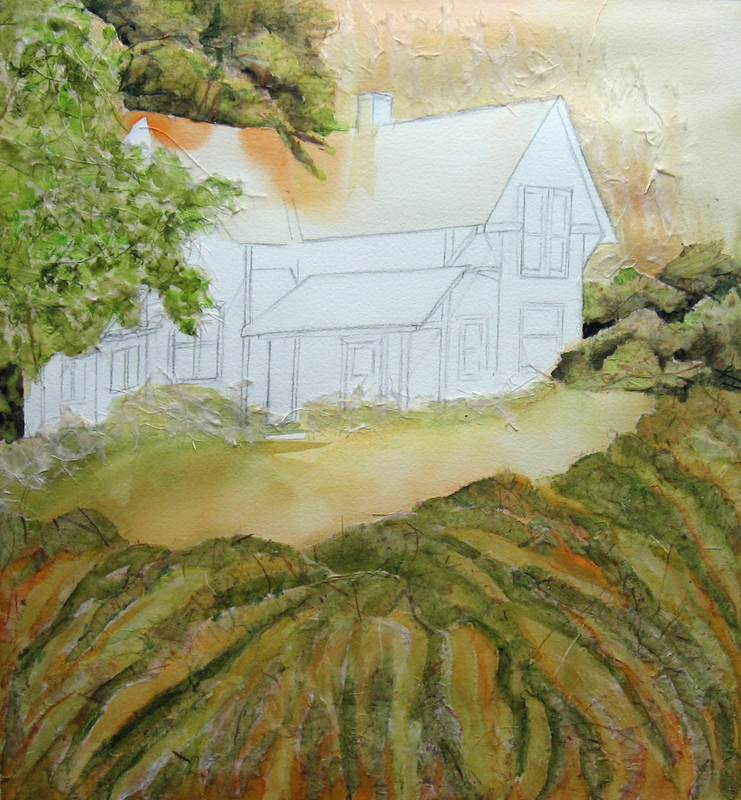 It was at this point that I decided I did not like all the blank sky and thought I may be able to enhance the hugging of the home more if I included more plant life. I decided to tear more rice papers in the shapes of large arborvitae to extend in a line behind the home. Mr.Brommer suggested that there can be furthur laying in of papers after our second wash of pigment. I like this concept of building a composition. I then had to allow this phase of the painting to dry overnight again. 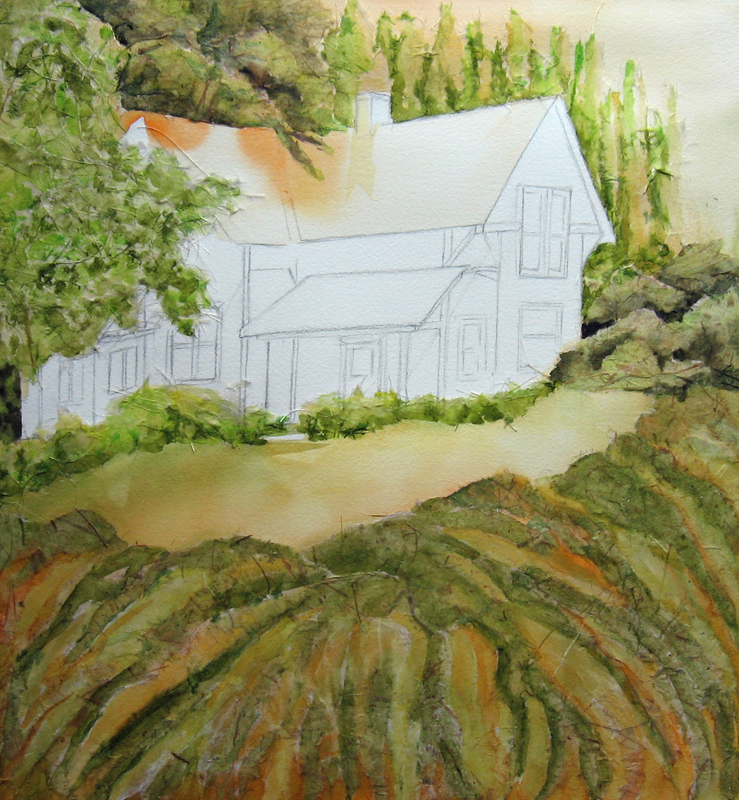 I, next, painted the arborvitae and was pleased that the home looked hugged by shapes of nature. 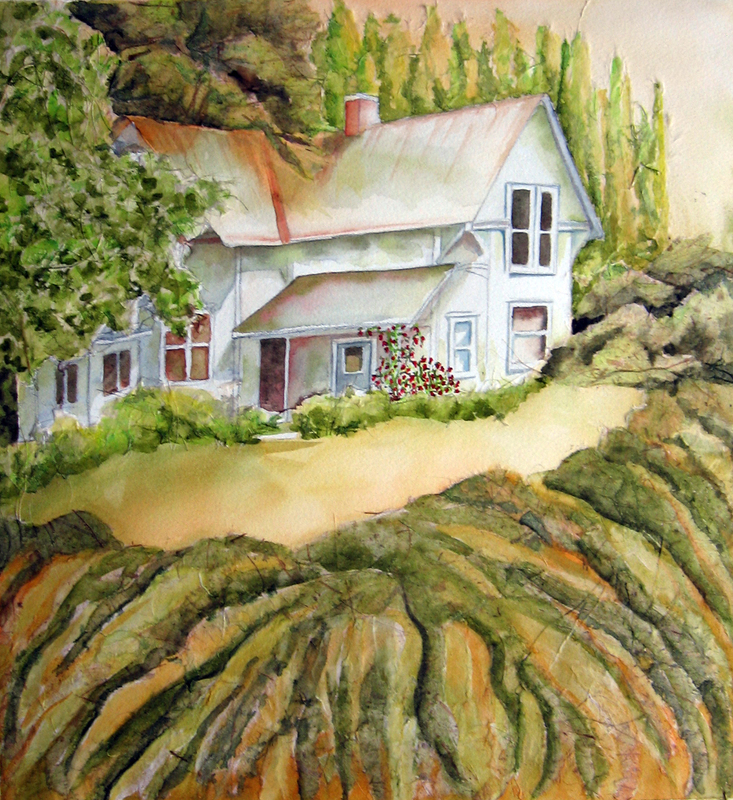 My final step was to paint the home and define the darks in and through the natural shapes to lead the viewer’s eye to the front porch. It was at this point that I was overwhelmed by a feeling of compassion for all who are and have faced incredible circumstances due to the loss of their homes through financial difficulties or natural disasters or those who are facing health issues and job changes. I added the roses and changed the title from “Living on the Edge” to “…there will be roses”. It is my sincere wish and prayer that beyond the loss and tragedy that you have suffered that there is a steady and positive force that enters your lives and you are lifted up and that, yes, …there will be roses in your lives again. The above is my final in a series of four experimental abstracts so that I could become familiar with painting and adding rice paper collage. In all four, I was to bridge the sides of the paper with washes of color, allow that to dry and then glue various torn or cut pieces of rice papers to the surface. After the rice papers dried, I was to apply more pigment and learn how the different rice papers took the pigment. 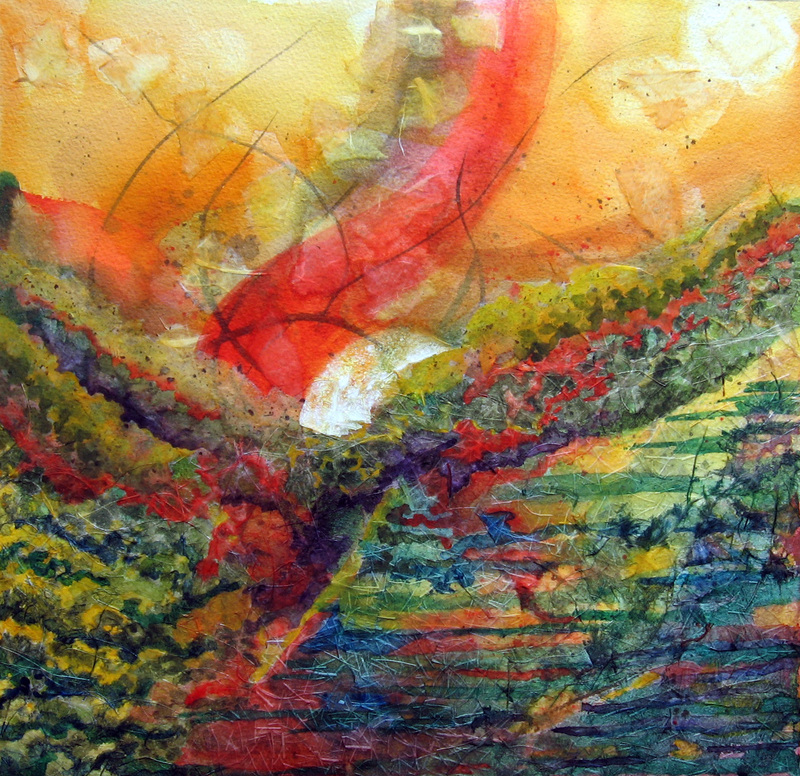 The goal was to create a painting where the rice papers became a part of the composition. Each of these four paintings began with little choice about the outcome on the part of the artist. I allowed the washes and paper pieces to show me the way. With this one, I wanted to get away from all that warm red and yellow energy I had included in the other three. I was searching for something restful. This piece, at first presented itself as a rolling undulating earthform. However, there was a paper I used in the lower righthand corner that presented itself as sharp edged and rather boulder-like. A wave-like form had developed in the upper wash. The land looked soggy and as though it was spilling off the page to the left. I began to think of rhythm and added the strips of building-like, ekg-like shapes in the upper left quadrant. They became dominant and so much like the beat of this rolling landscape. I was fascinated with the idea that the heartbeat came out looking as though it could double for a large city. Perhaps this painting raises my own consciousness a bit to understand that we have a role to play in keeping this earth rhythm going. What did the first dawn look like? This is the third attempt in my “getting to know painting on torn rice paper”. I absolutely do not know how the center of interest ended up in the center of the page. I have mentioned that I am allowing the papers and the pigment to guide me and am using the shapes and colors as my reference material as I build these. I build on what I see happening on the paper. 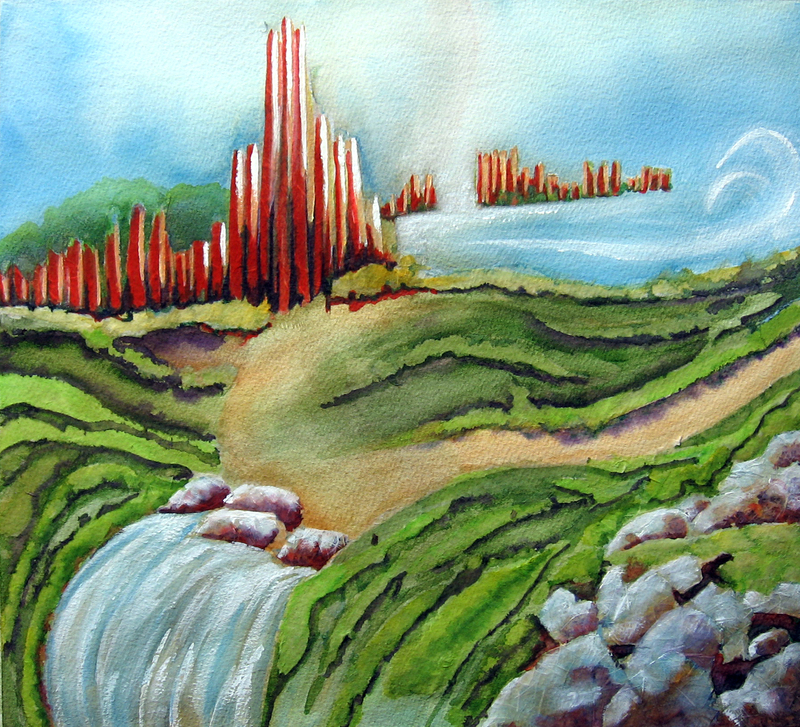 I was well into two thirds done on this piece when it screamed, “DAWN” at me. I saw the lone piece of rice paper in the upper right that said moon and the round shape appearing in the valley area. The orange streak waving down from above spoke of so much energy that it caused me to wonder what it must have looked like on the first day the sun rose and brought color alive. I had other thoughts like mountains and valleys, water and land, hot and cold and “energy”. There was something volcanic-like that touched me, also, with this piece. Thank you for the keen perceptions that you are all offering me on these abstract paintings. It is helping me to “let go” and learn from this experience. I am enjoying the process. One more to go before I can read furthur in the book. If you would like to view the first attempt, it is here. The second attempt is here. *AFTERTHOUGHT: Perhaps the first rising of the sun deserves the center of the page? The last night of Class is a bit hectic as evaluations need to be filled out, last assignments shared, and pictures of work taken. I usually try to come up with something new or simple that is art related. This year my Creative Drawing class sat in a circle and we drew each other. On a time limit and with a lot of chuckles, we came up with the above. The Creative Drawing class was asked to to create art by following a challenge I assigned . Week one they were to draw a skyline of a city across their page. From that line, using any media they chose, they were to create a city. They were allowed to use photos as reference for shadows and suggestions but were not to render their finished piece from any one photo. Week two they had to grid a reference photo, distort that grid and re-draw the forms to their distorted grid. Week three they were asked to cut up their reference photo into pieces and reassemble them so that their values and composition were interesting. They used that new composition for their finished piece. Week four they drew multiple drawings of old saxaphones and a flute I set out on table tops. They were to use these drawings as their reference material for a finished piece. The fifth week, they were to draw with paper. Yes, collage a drawing. I would also like to thank my Exploring Watercolor class for their hard work. Many of the students in this class have never watercolored before. Their first week was exploring wet in wet, wet on dry and dry brushing applications of watercolor, how to set up their palette and what each of their brushes were capable of. Their second week was an exposure to basic color schemes. The third week introduced liquid frisket and splattering. The third week they learned different ways to paint trees as well as how to do a large granulating wash for sky and water. The fourth week was devoted to how to lose and soften an edge in a form as well as suggestions and a demo in painting clouds. The fifth week was answering specific questions regarding what they had learned. They, too, worked hard as they were to paint a painting using what they had learned each week. I have posted their work on the Student Art 2 page here . 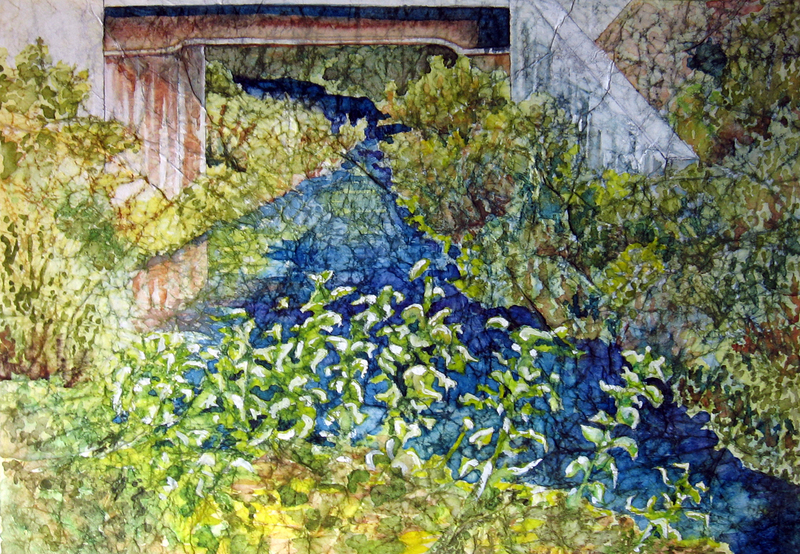 This is the second in four abstracts with rice paper and watercolor collage following the first assignment that Gerald Brommer suggests in his book “Watercolor and Collage Workshop”. I used 140lb rough Arches watercolor paper for this one, as he suggests. I have not painted on rough paper before. It is going to take a little getting used to. Once again, I was to start with a bridged pattern of strokes and splatters and washes, apply my different rice papers and then paint on top of that again. Shapes, colors and tones suggest where I need to go. This is so totally different from anything I have done before. I had a little problem in a few areas where the pigment took differently and I think it is because my matte fixative had become thicker than is best. I will need to pay closer attention to that. I want this one to speak for itself. Some of these images are surprising me. I know many relate to my thoughts and what is going on in the world around me. I think many can be interpreted in so many ways. The first attempt can be viewed here.